It is widely acknowledged that effects of predicted climatic change are likely to be the greatest in the sensitive high latitude environments and that associated feedbacks (such as reduced albedo and increased emissions of methane) may intensify global warming. A review of possible responses of Arctic terrestrial ecosystems to predicted climate change is given in Callaghan and Jonasson (1995). Environmental change, however, is not new to the Arctic. The Holocene climatic optimum, whose peak occurred at about 5.5-6 Ka BP, is sometimes used as an analogue for the verification of predicted changes. During the climatic optimum, annual mean air temperatures in Northern Eurasia were 3°C higher than at present. Climatic warming affected all aspects of the environment and most notably conditions of perennial freezing and distribution of vegetation. Unlike the thermal regime of unfrozen rocks and soils, which closely follows variations in air temperature, permafrost is a conservative realm; it has a long response time and reacts to climatic fluctuations slowly. The time lag between air and permafrost temperatures reached tens of thousands of years in the late Pleistocene and between one and two thousand years for the Holocene climatic optimum. Modelling, which is widely used to estimate permafrost temperatures during the Holocene climatic optimum, produces a broad range of results depending on the methods applied. Some evaluations show that a difference between permafrost temperature at present and during the climatic optimum is 2-3°C; other models produce a difference of 1-2°C (Baulin, 1967). In Western Siberia the permafrost temperature between 9000 BP and 3300 BP was only 1°C higher than now. This small variation, however, was important because it forced a water phase change, thawing of surface sediments, and activation of geomorphological processes. Quaternary permafrost and the relationship between permafrost and climate are discussed in above. Many attempts have been made at reconstructing the type and distribution of vegetation during the Holocene climatic optimum (Overpeck et al., 1997). Results of the latest reconstruction in the Eurasian sector of the Arctic, using pollen analysis and radiocarbon dating (Serebryanny and Khropov, 1996), are presented in Figure 8.10. Samples were obtained from fifty sites distributed uniformly across the Arctic. Results confirmed that natural zones and the southern boundary of permafrost migrated northwards. Boundaries of permafrost zones had a more distinct latitudinal pattern than at present. Compared to its present position, the southern limit of permafrost shifted by 4° latitude in European Russia, by 5° in Western Siberia, and by over 7° in Central Siberia. 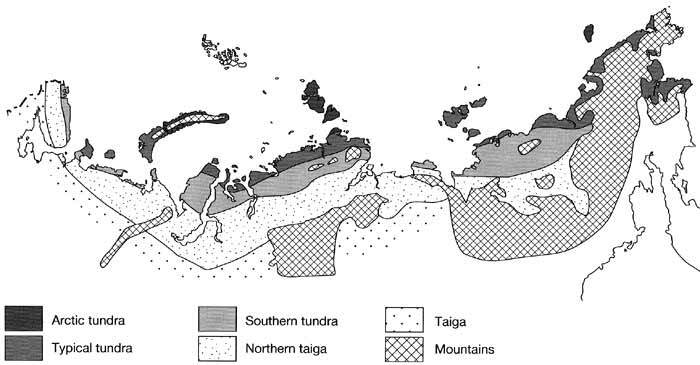 Migration of vegetation zones was particularly marked with the greatest changing occurring on the Taymyr peninsula compared to the regions to the west and east. Many studies have confirmed that the largest spatial changes in vegetation occurred in Central Siberia. On average, the shift on the Pechora plain in European Russia was 100-200 km smaller. Despite numerous confirmations of the fact, there is no agreement on the causes of this phenomenon. In order to answer this question, a comparison of data on the distribution of air and ground paleotemperatures, lithology, glaciation, ice content of grounds, and humidity on circumpolar scale is needed. Baulin (1967) explains a broader migration of the southern permafrost boundary in Central Siberia by the low ice content of the ground which resulted in more intensive thawing. Paleoclimatic reconstructions for the Arctic are hampered by two major problems. First, there is a lack of data for north-eastern Asia and second, most information refers to the valleys of large rivers and consequently is not characteristic of the vast mountainous region of Siberia. A warming effect of rivers is an important factor in the north which creates specific intrazonal environments. Thus, at present, forests penetrate further north along the large rivers (e.g., the Pechora, Pur, and Nadym) cutting into the tundra and forest-tundra environments. It is possible, therefore, that during the Holocene climatic optimum the slopes of the Putorana plateau, Polar Urals, and Khibins were covered by taiga while their central parts were occupied by forest-tundra vegetation. With regard to the use of the Holocene climatic optimum as a paleo-geographic analogue, it should be noted that this change had occurred in a relatively short time-frame and its effects had significant local differences. In the basin of the river Anadyr, for example, there is very little difference between the Holocene and contemporary vegetation. Another important aspect, as already emphasized, is that various components of the environment have different response times and were therefore affected by climatic change in different ways. Thus rapid warming in the forest-free areas resulted in greater and faster degradation of permafrost. In fact, permafrost response to thermal disturbance can be extremely rapid, which is confirmed by numerous examples of thermokarst being developed due to anthropogenic disturbance of the vegetation cover in the same region.